A small but informative and emotionally touching museum about the WWII Battle of Stalingrad at the authentic location of the German capitulation in the basement of a former department store in the centre of Volgograd. Unlike its larger counterpart, the Panorama Museum, this museum takes a closer look at the German side of the tragedy that Stalingrad was too, is full of fascinating details and authentic witness observations, and in addition also has quite a lot of original artefacts. More background info: For general background about the Battle of Stalingrad see under Volgograd (and also Panorama Museum, Mamayev Kurgan and Tractor Factory). 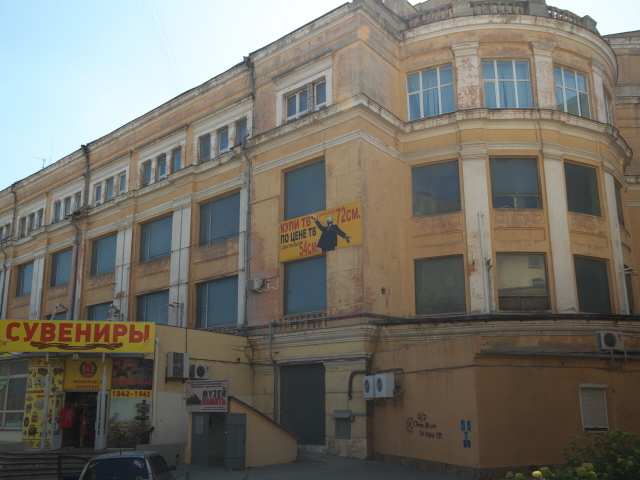 The building that the museum is housed in used to be the large five-storey “Univermag” department store of Stalingrad, which was constructed in the mid-1930s. Like almost all of the city the building suffered severe damage during the Battle of Stalingrad, but unlike most other damaged buildings it survived and was partly reconstructed (though it lost its top floor, thus becoming a four-storey building). Today, however, its formerly so iconic rounded front is hidden behind the Intourist Hotel that was constructed after the war. The department store does not seem to be in operation any more these days (I found its front entrance dark and locked and couldn't see any signs of renovation work going on). As for the importance of the site in WWII history: during the final week of the battle it was in the basement of this building that General Friedrich Paulus, the commander of the German 6th Army, set up his base (the basement also housed a German field hospital), and it was also here that he finally capitulated to the Red Army. He had been promoted to Field Marshal of the Wehrmacht by Hitler only two hours before. The implication was that Hitler expected Paulus to commit suicide rather than surrender, as the Führer had emphasized that no German Field Marshal had ever been captured alive. Paulus did not do him that favour, though. It is not entirely clear whether it was actually Paulus himself who initiated the capitulation when the Soviets reached the German command centre, or whether it had been pre-empted by his chief of staff. But anyway, Paulus, and his staff, were captured in the morning of 31 January 1943. Paulus was interrogated and taken POW. In the end, however, he fared relatively better than the other almost 100,000 German POWs taken at the end of the Battle of Stalingrad, most of whom never returned home (only about 5000 to 6000 survivors of the camps were eventually sent back to Germany in 1955). Paulus eventually turned against Hitler and served in the Soviet-sponsored anti-Nazi National Committee for a Free Germany (“Nationalkomitee Freies Deutschland”) that produced German-language propaganda against the Third Reich during the final years of the war. After the war, Paulus became a witness at the Nuremberg Trials, and in 1953 he was allowed to settle in what was then the GDR (East Germany), where he worked as a historian until his death in 1957. 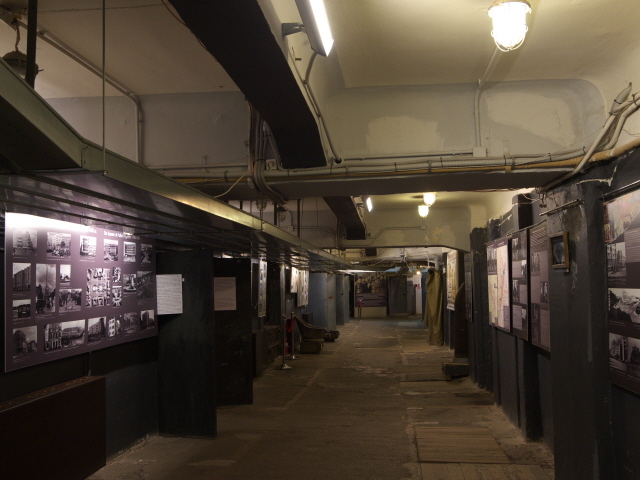 The basement under the Univermag department store in Stalingrad (from 1961 Volgograd) was turned into a memorial museum in 2003, for the 60th anniversary of the German capitulation and the Soviet victory. That's what “Pamyat” means, by the way: 'memorial' or simply 'memory' (in German: Museum “Die Erinnerung”). What there is to see: When you've found the entrance, made your way down to the basement and paid for your ticket, you start to the left of the ticket desk. You first come to a long central corridor, from which various rooms branch off as you go along. On the walls of the corridor itself are numerous photo-and-text panels about the history of the place and the war. In addition the odd small flat screen plays (silent) historical film footage too. The texts in the main panels usually come with English translations, which, although far from flawless (esp. articles all over the place, a typical obstacle for Russians when translating into English), are a great help all the same. Occasionally there are German translations in addition as well. Many of the texts are actually original quotes, which gives the narrative an interesting immediacy and offers personal perspectives (something that is almost totally absent in the Panorama Museum). In the exhibition rooms, the individual labelling of artefacts is usually in Russian only, but there are some summaries/overviews of the rooms' contents in English too. Some of the collections of photos and documents/letters don't come with any translations. So if you don't know any Russian (or German) some parts will remain obscure. But on balance this museum is definitely more “user-friendly” to foreigners than is the norm in Russia. The individual rooms on the left of the corridor contain sub-exhibitions and/or recreations of specific war scenes. This includes a room about a Soviet field hospital, complete with dummy soldiers, one injured and being dragged away, and lots of original artefacts from the battlefields and from such hospitals. The walls are adorned with paintings illustrating both – battle and treatment of casualties. Another, smaller room contains a reconstruction of a German headquarters room where the officers of the encircled German army were trying to have at least a certain semblance of a Christmas celebration, despite the dire situation. The recreated scene is apparently based on original photos of such celebrations that actually took place in this very basement – some of these photos can be found framed in the exhibition too, but unfortunately labelled only in Russian. There is a piano, a Christmas tree and on the table are some rare goodies, such as bottles of wine. Stacked boxes bear labels such as “Frohe Weihnacht” ('Merry Christmas') or “West nach Ost” ('from west to east'), so these were probably sent to the front from Germany. It looks cosy (“gemütlich”) and tragic at the same time. 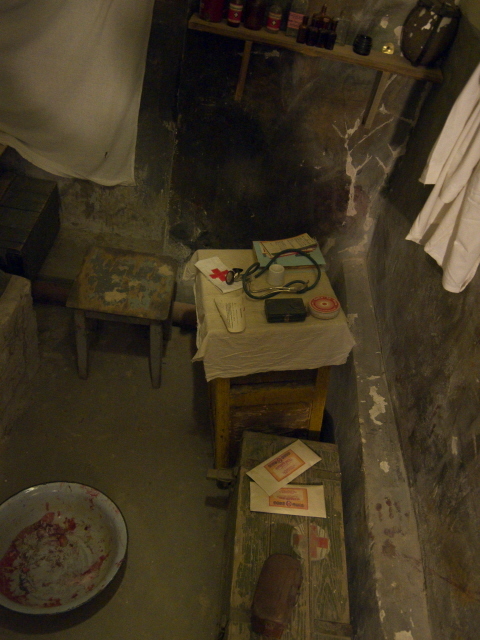 Opposite, on the other side of the corridor, is a small recreation of a German field hospital, such as actually operated inside this basement at some stage during the battles. There are countless presumably original artefacts here too and an elaborate panel describes every single one of them in detail, in Russian, English and German. Towards the end of the corridor come the most interesting parts: the authentic rooms of General Paulus and his chiefs of staff where they had set up their command centre during the last week of the battle. That is: these are also precisely the rooms where they were found, capitulated and were taken POW on 31 January 1943. The events of that day are described in great detail, including photos and quotes from both sides. This includes a photo of the first interrogation of Paulus (the original table you can see in the image is on display in the Panorama Museum!). Moreover a screen shows film footage of the capture and first interrogation of Paulus, providing more animated illustration. The two rooms themselves are more or less exact recreations of what they looked like on that day, complete with furniture and sandbags in the windows. In the “study” of General Paulus a suitably dejected looking, grey-faced dummy Paulus is standing staring at the floor while facing a Russian soldier by the door. The HQ room opposite is also peopled by dummy Nazis, sitting at their desks and also looking not all that happy. The dummies may make these scenes look a little bit cheesy perhaps, but this is more than compensated for by the fact that these rooms are the real thing! And place authenticity really makes history more palpable than any photos or texts. There are a few more artefacts in the corridor, such as a container for supplies dropped from the air into the area where the German soldiers were encircled – and accompanying texts explain how inefficient these attempts at air supplies really were. There's also a little bath tub on display that is labelled as being a genuine German tub for use “in the field” – and how effective this may have been is also rather doubtful. Back at the foyer room there's a detailed model of what the ruins of the Univermag building and its neighbours would have looked like after the battle. This stands at the bottom of the stairs that would have led up to the ground floor of the department store. Opposite the stairs is a circular room, echoing the rounded corner of the building, in which a separate exhibition is housed, entitled “From Paris to Stalingrad”. It chronicles the changing fortunes of the Third Reich's war effort, from shining initial success in the West (France especially) to the turning point of the defeat at Stalingrad in the East, from where on Germany was sliding further and further into disaster and eventual collapse. I am, however, not sure whether this was a temporary exhibition or permanent. It was mostly in Russian only. The same goes for yet another extra exhibition in the next room, which is actually the largest room in the basement. All labelling and explanatory text in this exhibition part was in Russian only but I gathered that it was mostly biographical in nature, covering some key figures in the story of Stalingrad. The parts about Paulus were the most interesting for me here, firstly because it included documents in German that I could understand and also because it was about the role Paulus played in Soviet propaganda against Hitler and the Nazi Reich after his capture (see above). Most poignant for me was the post-war letter by Paulus, reproduced here, in which he offered to appear at the Nuremberg Trials as a witness for the Soviet prosecution and in which he also contemplates his own guilt in having followed the Nazis' orders for too long. By far the most touching section in this museum, however, was the display of quotes from letters and cards from ordinary soldiers in the other half of this large room. Supplementing the displays were also folders one can peruse at a set of tables. These contain facsimiles of German “Feldpost”, i.e. letters sent home mostly from ordinary soldiers, in which the despair – but in some cases also complete reality denial – comes across first-hand and at full force … provided, that is, you can read German (there are no translations, neither into English nor into Russian). And even if you can, you will still struggle with some of the letters, namely those penned by soldiers who obviously hardly ever had resorted to the written word before and whose command of orthography (and sometimes grammar too) was, to put it mildly, “patchy”. But of course that only emphasized the tragic qualities of these documents all the more. I admit that I had quite a lump in my throat on several occasions whilst reading these. Also in this room, finally, are the two largest objects on display: a motorbike with a sidecar and a whole limousine, both most probably German models, and next to these a larger flat screen played yet more film footage in a loop. All in all I must say that I found this relatively small museum much more convincing and engaging than the better-known, more established, and much larger Panorama Museum of the Battle of Stalingrad. And that is not just because it included some in-depth coverage of the German side (and many German artefacts and documents). It is also due to plain old place authenticity, being in the very basement rooms in which a battle was practically ended that had been the bloodiest in world history. For that reason alone I strongly recommend this museum, even if it's a bit old-fashioned and anything but hi-tech. Location: right in the centre of Volgograd, but its entrance is a bit hidden behind the Intourist Hotel and the Univermag building, in the courtyard off Ulitsa Ostrovskogo. NOTE: the museum entrance is not at the official address of the Univermag building as such (on Ploshchad Pavshikh Bortsov – 'Square of the Fallen Fighters' – that's on the other side of the building where its modern front façade is) as some sources, including Google Maps and the museum's own website, would make you believe! Access and costs: a bit hidden, but very centrally located; very affordable. To find the museum you have to enter the courtyard behind the Hotel Intourist, either from Ulitsa Mira, opposite the Post Office, into Ulitsa Ostrovskogo, or, when coming from Prospekt Lenina, walk up Komsomolskaya for half a block until you come to the gap on your left, which also leads into Ulitsa Ostrovskogo, from the other side. Opening times: daily except Mondays, from 10 a.m. to 6 p.m.
Time required: depends, in particular on whether you can read Russian and/or (more importantly perhaps) German, in which case there's lots more to read than just the English. So something between half an hour for a quick look around and well over two hours for an in-depth exploration. The most obvious combination – and comparison with – has to be the Panorama Museum of the Battle of Stalingrad at the Old Mill ruin. While that institution is the larger and more pompous, and more visually polished counterpart, the Pamyat Museum compares rather favourably, scoring over its big brother in terms of place authenticity, balanced breadth of coverage, foreigner-friendliness and absence of the OTT glorification that at the Panorama Museum often overly dominates. Fans of seeing military hardware, uniforms, medals and such like, however, do get a better deal at the Panorama Museum. Personally, I much preferred the Pamyat Museum. Combinations with non-dark destinations: being right in the centre, the museum obviously combines well with most of the (few) mainstream attractions of Volgograd.